If your kids are anything like mine then they are probably in overdrive waiting for Cars 3 to come to theaters this summer. June 16th cannot come soon enough in my household. We are watching Cars 1 and 2 a LOT, in preparation. Not because we want to, but because the kids want to. Don’t get me wrong, I love Cars. But after the umpteenth viewing, it gets a little tiring. So I have had to look for other ways to quench their Cars thrust while keeping my tv screen Cars free for a while. Thank goodness for Highlights Along The Way. This fun blog has some great Cars activities and even a Cars 3 printable game. This printable set is so much fun. We have even played together as a family. The kids are so excited for the next big Cars adventure and we plan to see the movie together as a family. We will wear our Cars gear, from t-shirts to hats as we have a lot of it. The kids have always loved Pixar, and Cars has been one of the best things to come out of Pixar. If you too are dealing with Cars overload and want a small break in the madness check out these fun printable to keep your kiddos busy until June 16th. It is fun, simple, and keeps them quietly creating and playing. Check out Highlights Along The Way for the awesome downloads now! This entry was posted in Activities and tagged Activities, activity, car activities, cars, cars 3, cars printable, Disney, download, highlights along the way, lightning mcqueen, pixar, print out, printable, the boys store on May 25, 2017 by Lacy. What boy doesn’t love his toy cars. There are usually dozens, if not hundreds of them all over the house. Wouldn’t it be nice if there was a special place to store them? Like a garage? Well with this incredibly cool craft you and your boys can customize a totally awesome garage for their favorite cars. Not only is this craft fairly easy and fun to create it will also help you get rid of some trash (and recycle it!) into a usable toy. Do you have some paper towel rolls lying around? Toilet paper rolls? A shoebox? Now is your chance to use them in a more efficient way, no more clogging up the trash bin. This is not only a great way to reuse something you would otherwise trash it also is a great teachable moment. 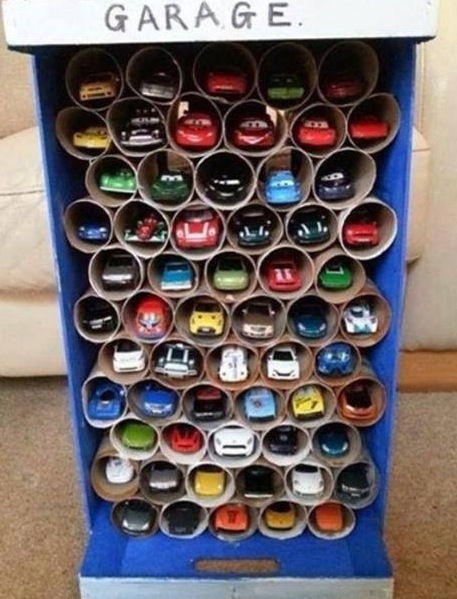 You are showing your kids that you can always reuse things in new and different ways. Recycling isn’t just boring sorting in bins. 1. Take your shoe box and cut the lid in half. Tape or glue both halves on the top and bottom of either end of the box opening side out. 2. Next start organizing your rolls. Decide how many you can fit across the width of your box. Then start gluing them to the bottom of the box, side-by-side. Leave a half in to inch gap between the walls and the bottom row of rolls. This way you can stack the next row on top. 3. Stack the next row so that there are two more rolls in this row than the one before. So that each roll rests between the two on the bottom. 4. With each row make sure you are resting the rolls into the two rolls beneath them, continue until all the rows are glued in. 5. Now that all the rows are glued in let them dry then you can paint or color on your garage to customize it. Enjoy your cool new car garage by gathering up all your favorite cars and putting them in their brand new home. Now you will always know where your cars are and you have a spectacular way to display an incredible collection! This entry was posted in Activities, Learning and tagged Activities, cars, crafts, matchbox garage, recycling, the boys store, toilet paper rolls craft, toy car garage on May 19, 2014 by Lacy. Valentine’s Day is a great holiday when you have little girls, but little boys can sometimes think that it is too mushy of day. Boys prefer fun, big, loud, and crazy things. Valentine’s Day can sometimes be quiet, sweet, and soft. Not really up to par for boys. But there are ways to boy up the day. Boy valentines can be easy to make at home with your computer or with some special paper and scissors and glue. Here are a few ideas for Valentine’s Day that you and your boys can try this year. Printable Cards: Brightside Prints creator Jill Means has created some adorable printable cards for boys inspired by the things boys love like cars, trucks, tractors, dinosaurs, Robots, and Super Heroes. Boys will love sharing these fun cards with their classmates and friends. 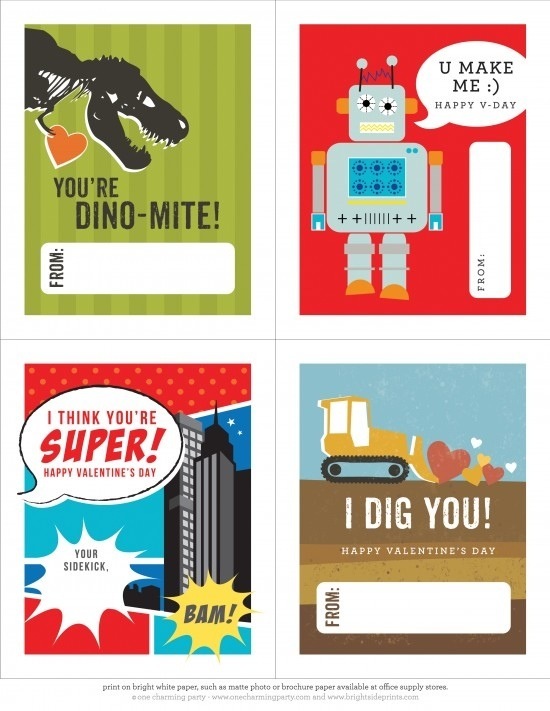 With cool phrases like “You’re Dino-Mite!” “I dig you” and “I think you’re super!” Boys won’t feel like the holiday is as lame as they first thought. 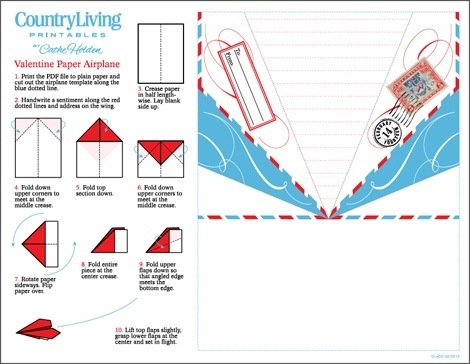 Paper Airplanes: CountryLiving.com has a great free printable that can be folded into a paper airplane and given out as valentines. Simply print out the template then fold along the dotted lines. Let your son fill out the valentine with his own sentiments, then you ave a great card for valentine’s day. Zombie Printables: Hanasaurusrex is a great blog with some incredible boy crafts, games, and info. They even feature a free printable for Valentina’s day. These zombie cards are to die for. 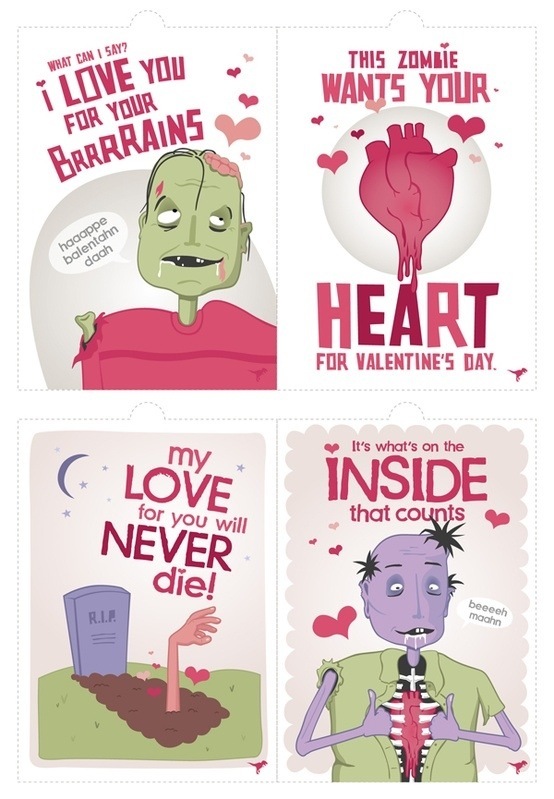 With incredibly cute and funny sayings like “My love for you will never die!” “I love you for your brains!” And “This zombie wants your heart!” Your boys will love the laughable puns and pictures. Now your son has the perfect card for Valentina’s day. This entry was posted in Activities and tagged cards, cars, fun, robots, the boys store, trucks, Valentine's Day, valentines, zombies on February 4, 2013 by Lacy.